The Canon Pixma MP640 is a multifunctional printer that ensures to deliver high-quality printouts in both monochrome and colour. This network-ready printer is aimed at small offices and photography enthusiasts who are seeking for an affordable option. The printer dimensions are 450 mm wide, 176 mm tall and 368 mm in diameter which is a little too big for small desktops. At a weight of 8.8 kg, the Canon Pixma MP640 is a quite lightweight machine. The scanner and copier are both fast and produce impressive copies. The print resolution of the printer is 9600 x 2400 dpi which is quite impressive. The output paper tray and the control panel cover can be closed when not in use. Under the cover of the control panel, the TFT screen is integrated. The printer features wireless connectivity and also supports Ethernet for wired networking. The printer uses five-ink system technology that produces high-quality documents and photos with Canon Pixma MP640 Ink Cartridges. The printer prints a little faster at 9.2 ppm in monochrome and 8.1 ppm in colour. The prints come out sharp. Despite the slightly improved print speed and the efficient scanning and photocopying capabilities, the Pixma MP640 is expensive to run. Canon may also need to improve on the clumsy design which makes the printer look a little too bulky. Q. Under what conditions should I buy compatible Canon Pixma MP640 ink cartridges? A. At some point of time, the quality of the prints produced from your Canon Pixma MP640 printer might start getting faded. You might start getting poor quality prints, which eventually affects your work. Under such circumstances, your ink cartridge needs replacement. It is not possible to purchase original ink cartridges everytime. Buying the compatible Canon Pixma MP640 ink cartridges means getting good quality results at low cost, which would be beneficial for your business. You can buy your choice of compatible ink cartridge at Printerinkcartridges.ie. These cartridges are ideal for home customers to print photos, projects and the good quality documents at an affordable price. Q. Using this printer, is it possible to print directly from a memory card or a flash drive? A. Yes, the printer can print directly from a memory card or a flash drive. The printer supports wireless network also. Q. For my Canon Pixma MP640 printer, suddenly cyan coloured Canon Pixma MP640 ink cartridges got empty. Do you offer single pack Canon Pixma MP640 ink cartridges of cyan colour? A. Yes, definitely. We at Printerinkcartridges.ie offer both single pack and multipack ink cartridges. You can find single pack ink cartridges of cyan colour at https://printerinkcartridges.ie/cli-521c-canon-inkjet-cartridge. Q. Does the printer support colour printing? If yes, what is printing speed? A. Yes, the printer supports colour printing. The printer prints a little faster at 9.2 ppm in monochrome and 8.1 ppm in colour. Q. I would like to know about the weight, dimensions and the printing resolution of this printer? A. The printer weighs 8.8 kg, measures 450 mm wide, 176 mm tall and 368 mm in diameter and has the printing resolution of 9600✕2400 dpi. Q. What all devices can I use to print pages with Canon Pixma MP640 printers? A. Canon Pixma MP640 printers support printing directly from memory cards, PictBridge enabled cameras and computers. They also support mobile printing, but you will need an additional bluetooth adapter to do so. Q. I have unused cartridges from my old Canon Pixma MP540 printer. I was wondering whether I could use these ink cartridges with my Canon Pixma MP640 printer too? A. Yes, you can use these ink cartridges with your MP640. Canon Pixma MP640 ink cartridges are the same as those used in the MP540 printer. Q. Can the Canon Pixma MP640 connect to the Wi-Fi? A. Yes, Canon Pixma MP640 printers come with wireless connectivity. This mean you are not required to physically connect your printer to the computer to print pages. Q. 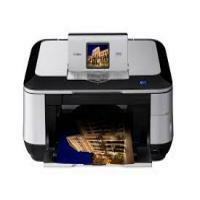 Where can Canon Pixma MP640 printers ideally be used? A. Canon Pixma MP640 printers are capable of printing from multiple devices, support wireless printing and have an auto duplexer which enables two sided printing to save time.They also come with copying and scanning features, which make them great for small offices. Their high quality photo printouts and PictBridge support makes them suitable for photographers too. Q. Will using compatible Canon Pixma MP640 ink cartridges invalidate my printer’s warranty? A. Absolutely not! Our compatible Canon Pixma MP640 ink cartridges are FSC tested and certified. They are specially designed to work well with your printer without any hassle. A. All you need to do is insert the CD-ROM that you got with your printer and follow the instructions prompted on the screen. You can choose the settings according to your own needs. You can refer to the “Getting Started” manual for detailed instructions here. Q. I urgently need Canon Pixma MP640 ink cartridges. Is there any way I can get them faster than the standard delivery time? A. Please contact us on 048 308332211, we will check our stock and try our best to deliver the product to you as fast as possible.